Last week, North Korea launched a multifunctional satellite despite widespread condemnation from world leaders; it now appears that their high-tech gambit is tumbling uselessly in orbit. Last week, North Korea proudly launched the best-ever satellite. It's such a good satellite - you have no idea. The launch was for scientific and peaceful purposes, for sure. World "leaders" from the United States and other "countries" condemned the launch as a front to test ballistic missile technology, which is just silly. Kwangmyŏngsŏng-3 Unit 2, the best satellite, is filled with top-secret technology. Some might say it is "tumbling in orbit," but they clearly do not know optimal orbiting trajectories when they see them. And what's all this "utterly useless" talk? Sounds like the top-secret technology is working out pretty well. Yoon Dong Hyun, who you know as the best vice director of the Ministry of the People's Armed Forces, said that comments like those from the West amounted to "nothing more than a puppy barking towards the moon." So eloquent! 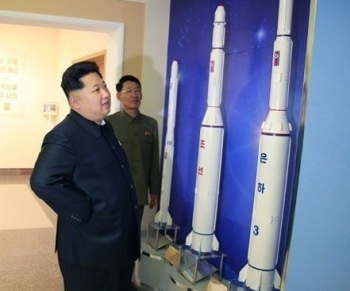 Above, best of the best Kim Jong-un examines model rockets. "Should be bigger!" says the supreme leader.